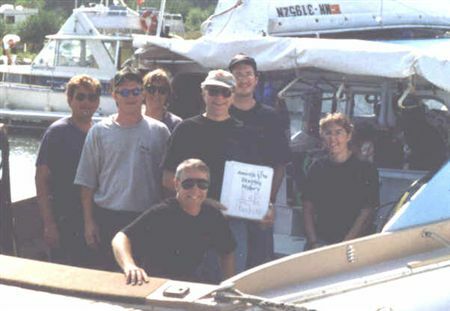 This year's project team was greeted with fair weather and 60 degree water at the wreck site. The trip was from 6-9 August, and the team members were GLSPS President, Ken Merryman, and GLSPS members, Steve Daniel, Malinda Miller, Al Brown, John Nori, Chris Olson and Laurie Janikowski. 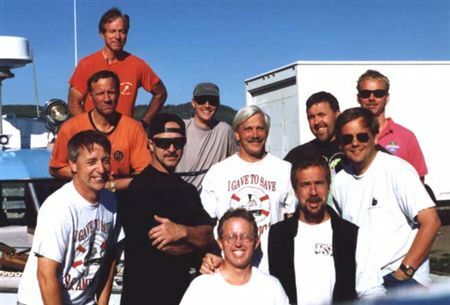 They worked off of the venerable boat Heyboy. The project goals included detail drawings of the engine room and measurements of the main deck and aft boat deck. 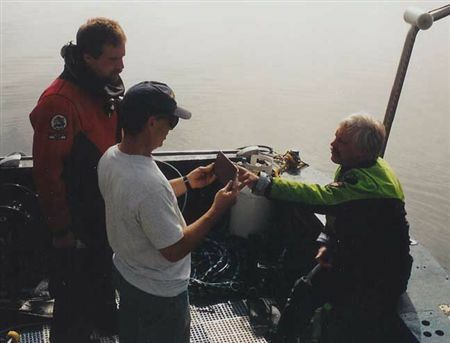 During the coarse of ten dives, the dining room and social salon, engine room and number two cargo hold were measured and recorded on a master print back on board the Hey Boy. Measurements were also taken of the cabin deck and fantail section for the September construction project. Most times, members were paired off for different dive tasks. In addition to the mapping activity, Steve Daniel did underwater sketching to record details of the passenger cabins, rear skylight on the boat deck and the grand staircase in the social salon. Details of the engine as well as the pumps, blower and several other pieces of equipment were also sketched. The rough drawings were then redrawn proportionately on graph paper. Like last year, videographer Al Brown recorded the action underwater. According to Malinda Miller, "The mapping project went better than I anticipated. I was not sure how much we were going to get accomplished from our wish list of jobs, because some people backed out in the last week before the trip." 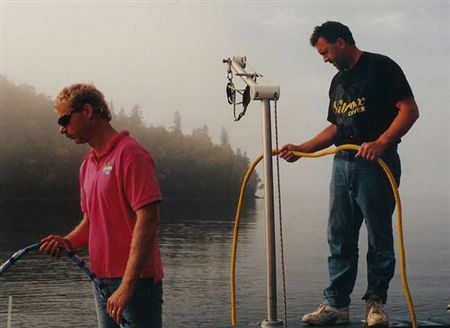 "Steve Daniel picked up the slack and all the project tasks were accomplished," she added. 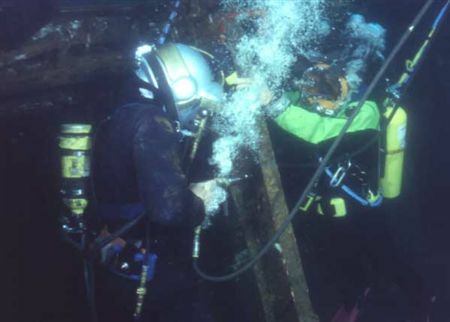 To map a shipwreck underwater a waterproof measuring tape is used with two divers to measure a vessel stem-to-stern and abeam at numerous points along the keel line. This establishes locating points for walls and rooms and other details within the ship. Notes and sketches are made using a pencil tied to a plastic slate. Waterproof matte polyester sheets are taped or clamped to the slates for use underwater. All the team members volunteered their time, and the trip was a great opportunity for them to practice what they learned in past GLSPS mapping classes. 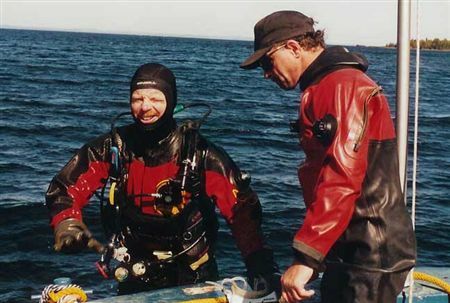 All drawings are now available in the book written by Steve Daniel and published by GLSPS - SS America: A Diver's Vision of the Past. The SS America Preservation Project has moved out of the experimental phase and into the documentation and stabilization phase. These two phases will take one more year. 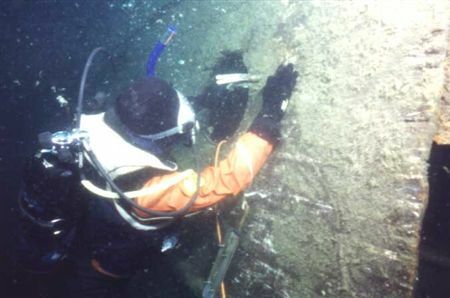 The intent of these phases is to document the current condition of the wreck and stabilize structures that might deteriorate during the following preservation phase. The preservation phase of the project will probably take years of work. Our plan is mapped out in detail in the SS America Preservation Project Proposal, which the America Project Committee wrote the past winter. We completed this year’s planned stabilization work and visitors will notice some significant improvements to the structure. We focused mainly on stabilizing the boat deck and re-hanging the pipes on the starboard side of the Social Salon to create safe access to the cabins so we can continue the work inside. We finished hanging the pipes on the starboard side, adding a temporary support system to the boat deck, rebuilding the truck bed, stabilizing the grand staircase, and adding fasteners to stabilize the starboard ship side of the companionway. We left the galley stabilization for next year. The real positive feature about this year’s project was the number of new participants. Stan Braun, Paul Cording, Ben Erickson, Brian Nylander, and Tim Tamlyn joined the construction team and expanded our talent pool. They joined the “old guard” Ron Benson, Ken Knutson, Bob Olson, David Schmidt, and Ken Merryman. Videographer Al Brown continued his documentary on the project. 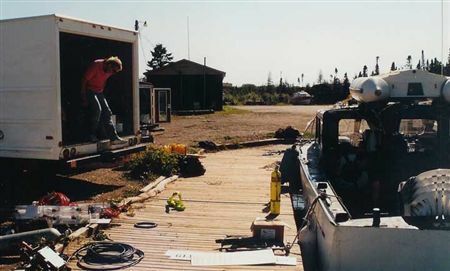 We also had the best work platform that we have ever had with the addition of the Alma, Ron Benson’s boat. 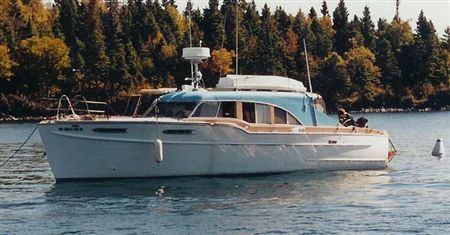 Boats Heyboy and Marge Talk, belonging to Ken Merryman and Stan Braun furnished the rest of the surface support. Accommodations were comfortable and food was good. The results were gratifying. It is really enjoyable now to swim into the social salon through open doors since the pipes no longer block the entranceways. Swimming through this direction also makes the engineer’s quarters more visible. We had to make some major changes in the original designs for the pipe hangers. Each steel beam we hung them from was different and presented its own set of problems, but the pipes are now firmly in place. The Model T truck bed had deteriorated down to the last board with only one nail holding it. It is now almost totally intact again. The boat deck is still dangerously close to collapsing even with the new supports. It will be a year or two before we can get more permanent supports under this deck. When you dive the America next year, this area is probably best enjoyed from the outside. As usual we would have liked to have done more, but keeping an efficient pace that does not compromise safety or quality of results is a hard line to walk and we tend to walk it on the conservative side. Dave Schmidt and Brian Nylander talk on Alma's back deck. 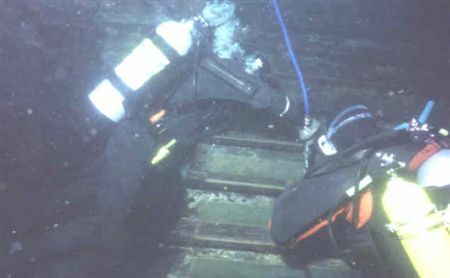 Divers stabilize the grand Staircase in the Social Salon. to attach the plate to the boat deck support. existing cabin beams by Ben Erickson and Bob Olson.